When it comes to anti-aging procedures you might explore how you might benefit from cosmetic dentistry. From simple fixes like teeth whitening to more advanced procedures intended to improve your underlying facial structure, modern dentistry can cause not only a brighter smile, but also a more youthful appearance. I caught up with Irene Grafman DDS, one of the few dentists specializing in facial development. A pioneer in bringing a relaxing, spa-like feel to dentistry, Dr. Grafman is a third generation dentist who opened her practice, Smile Health Spa, fifteen years ago at 120 East 36th Street. She has conducted extensive research on the interconnectivity of the mouth and body based on her own experiences with health and aging. According to Dr. Grafman, after the age of fifty and your body begins to show signs of aging, your mouth can also show signs of aging. Yet she says that many of us think of our mouth as a separate body part and don’t realize the connections it has to our entire body. “The way our jaws developed during childhood, how our teeth come together and how our TM (temporomandibular) joints sit may have impact on our posture, headaches, sleep and how our faces age,” she explains. Facial aging is due to the lessening volume of both hard and soft tissue. “During the aging process, we lose fatty tissue and the bones of the face shrink. As the bones shrink, our skin starts to sag creating the appearance of wrinkles,” says Dr. Grafman. But there is good news! This loss of volume can be replaced with injections of facial dermal fillers while dental advancements and appliances can treat the underlying problems to help create a more balanced and youthful appearance. Dr. Grafman isn’t recommending dentistry over cosmetic procedures such as dermal fillers, but she advocates coordinating the two. Doctors don’t always realize how good dentistry can improve the face, she says. 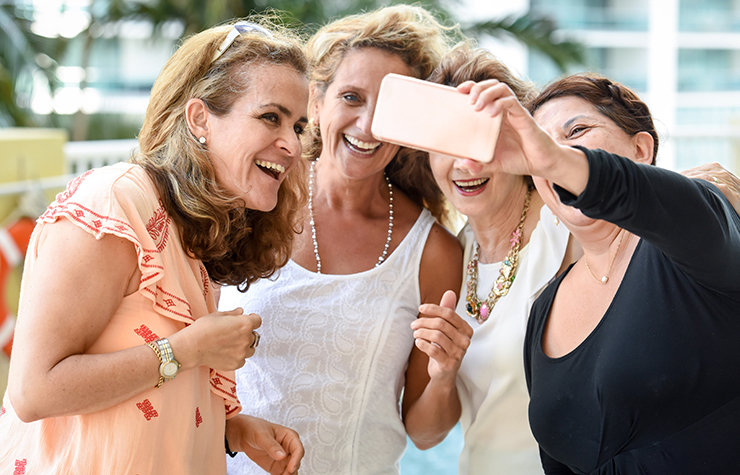 “Working together we can customize the perfect treatment to give patients the results they desire.” The numerous possibilities in cosmetic dentistry will not only make you look younger, but feel younger too. The easiest method to make you look younger is to reverse the yellowing and discoloration that comes with age by whitening your teeth. The process is easy, inexpensive, safe and conservative. With the right products, the results can be startling. Prices range: $450 to $1,500. After your teeth are whitened, they need to be maintained. One of the most conservative procedures that whiten and reshape a smile is bonding. Bonding can lengthen, straighten and whiten teeth without compromising tooth structure. Bonding material (a cosmetic resin/plastic) can be added to teeth that are poorly shaped, crooked, discolored or worn down to redesign your smile and improve the shape of your face. The procedure is fast, simple and requires no anesthesia. Performed by a dentist specializing in bonding, the procedure will last 8 to15 years. Price range: $500 to $2,000 per tooth. One of the fastest and most effective ways to create a youthful smile is by applying porcelain veneers—thin ceramic shells— to cover your existing tooth structure. The procedure can correct teeth that are cracked, stained, misaligned or poorly shaped and produce teeth that are white and straight, making it possible for you to present a well-proportioned smile for 10 to 15 years. Price range: $1,000 to $2,500 per tooth. Special appliances worn only at night can create a younger appearance during the day by improving the upper airway, which can also result in better quality sleep. Better sleep may not only change your wellbeing and take years off your face, but it will add years to your life. Wearing these appliances may also result in consistently broader smiles during the daytime and eliminate black triangles—areas between your teeth and the corners of your lip—and give you a narrow arch appearance, higher cheekbones and more open eyes. Price range: $4,000 and up. The results are permanent with retention. The most important innovation in dentistry is tooth replacement. A good number of people over 50 have lost one or more teeth. And the loss can lead to other problems, causing your teeth to shift and TMJ disorders (pain involving the temporomandibular joint, the hinge that connects the jawbone to the skull) But due to today’s high tech dentistry and improved implants, dentists can restore almost any troublesome situation and safely restore your quality of life, whether you need a single tooth replaced, a full mouth reconstruction or stability for dentures. But don’t depend upon these procedures alone: Good dental care is always key. Nothing is more important than maintaining a healthy clean environment in your mouth. Dr. Grafman highly recommends regular professional cleanings and taking care of problems in their early stages instead of waiting for small problems to become big ones. Irene Grafman DDS Smile Health Spa. Comprehensive cosmetic dental services, including gum recontouring/Smile Lift, smile rejuvenation, cosmetic bonding, porcelain white veneers and all-white crowns, Invisalign and facial enhancements. 120 East 36th Street. 212-532-5377. Bijan Gahari DMD has taken over the practice founded by the late Dr. Irwin Smigel, known as the “Father of Aesthetic Dentistry”. 635 Madison Avenue, 212-371-4575. Michael J. Wei DDS “Smile Makeovers” with restorative, cosmetic and prosthetic procedures, whitening and more. Snap-on Smile for fast and affordable smile improvement for special occasions. 425 Madison Avenue. 646-798-6490. Janys Geldberg DDS Holistic and cosmetic dentistry: A coordinated treatment plan that includes teeth bonding, porcelain veneers, gum sculpting dental implants and more. Take the Smile Analysis online to rate your smile. 19 West 34th St. 212-594-5706. Heejoo Pyon DDS A full array of services, including porcelain crowns and veneers, dental implants, whitening and Invisalign. 30 East 60th Street. 212-847-5052.